USD/JPY suffered a major flash crash after Apple issued an earnings warning and as liquidity remained low. While some currency pairs recovered, dollar/yen remains on the low ground. What levels should we watch out for? The Technical Confluences Indicator shows that the pair has significant support at 106.72 where we see the previous one-hour low, the Bollinger Band 15-minute Lower, and the Pivot Point one-month Support 2. Below this level, we see no cushion at least until 105.60. 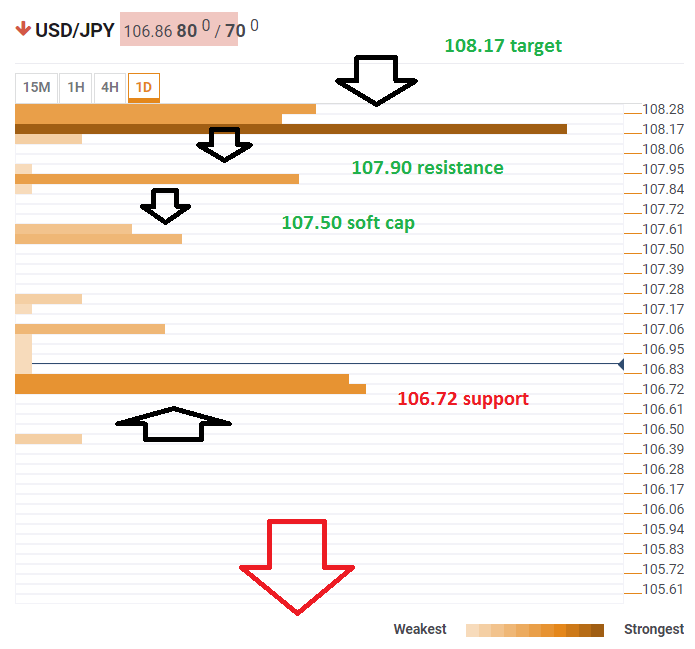 Looking up, there is some resistance at 107.50 which is the meeting point of the Pivot Point one-week Support 3 and the Bolinger Band 15-minute Upper. Another cap awaits at 107.90 which is the convergence of the BB 4h-Lower, and the previous 4h high. The most substantial cap is at 108.17 where we see the confluence of the PP one-day S2, the PP one-month S1, and the PP one-month Support 3.